(Nanowerk News) A potential path to identify imperfections and improve the quality of nanomaterials for use in next-generation solar cells has emerged from a collaboration of University of Oregon and industry researchers. In their study, detailed in the Journal of Physical Chemistry Letters ("Spatial Mapping of Sub-Bandgap States Induced by Local Nonstoichiometry in Individual Lead Sulfide Nanocrystals"), researchers investigated electronic states of lead sulfide nanocrystals. By using a specially designed scanning tunneling microscope, researchers created atomic-scale maps of the density of states in individual nanocrystals. This allowed them to pinpoint the energies and localization of charge traps associated with defects in the nanocrystal surface structure that are detrimental to electron propagation. 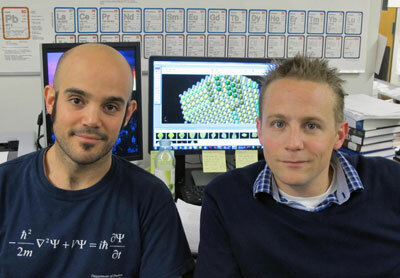 University of Oregon doctoral student Christian Gervasi, left, and Thomas Allen of VoxtelNano led a university-industry collaboration to create atomic-scale maps of the density of states in individual nanocrystals with a specially designed microscope. The maps promise a route to next-generation solar cells. "Nanoparticles are not always stable. It is a fundamental problem. When you synthesize something at this scale you don't necessarily get the same structure for all of the quantum dots. Working at the atomic scale can produce large variations in the electronic states. Our tool allows us to see these states directly and allow us to provide feedback on the materials."